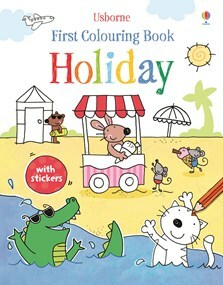 A bright and fun colouring book for young children, full of friendly animals on holiday. Scenes include an outdoor hiking adventure, a sailing trip to the lake and a cosy camping trip. The background on each page is already coloured in so children can focus on the really interesting details. With holiday stickers such as boats, picnics, suitcases and sunglasses for children to add.